As you may or may not know, The Ohio Art League hosts the Art INFOrmal every month. A group of artists, art-appreciators, and those who might want to make the transition from watching to doing gather in a relaxed show-and-tell. Artists then get the opportunity to discuss what they are working on, and accept feedback and critique from the other group members. If you’re new to Art INFOrmal, like I was, then you’ll be glad to know that for the uninitiated and artless, it’s a great way to unwind after work and get inspired. If you’re an artist—whether just spreading your wings or with a few big sales under your belt, the positive, helpful dialogue, support and encouragement are definitely worth bringing your pieces in and subjecting them to the public eye. The extra added bonus is being given the opportunity to speak freely and openly about your work—what makes you tick, why you started doing what you do, and what you hope to accomplish. Being able to express these things in front of the group can do a lot for the artist who is just starting out or hoping to strengthen their artistic mission and voice. This month’s Art INFOrmal was a collaboration with Fresh Air, and the turnout was large enough to fill ¾ of the OAL space at the Gateway. Artists ranged from a woman who paints cats, hearts, paisleys and guitars with wings with all the gusto of a folksy Lisa Frank, to a gentleman who created tables decoupaged with sports, black history and Marvel Comics themes. He presented his pieces using a digital picture frame (so those of you who create large works, yes, there is a way to display them to the Art INFOrmal audience!). While Art INFOrmal has come and gone for April, no need to fear! The next event will be held on Tuesday, May 20th, from 6-8pm at the Ohio Art League Gallery. Bring your pieces in—whether “in the flesh”, in albums that audience members can pass around, or on a slideshow on your laptop—or don’t! If you love making, appreciating or talking about art in a laid back context, you’ll want to be sure to stop by for the next Art INFOrmal. I’m taking a moment from deciding the best way to dress up like a unicorn for One Night to let you know how our biggest party of the year is evolving. It’s got legs, people! The Athletic Club and Bodega are now on board to shower revelers with their culinary delights. Also, my favorite radio station, CD101 has just become one of our biggest sponsors and will be giving away free tickets during the week of May 3 to May 7! Of course, you can also get free tickets if you are an OAL member and would like to submit at least 2 pieces for the silent auction. For this beast has two heads: Fund-raising silent auction and funkadelic fete. If you’re not an artist (maybe you play one on TV?) you can still get your free ticket by signing up to be a volunteer. Many hands make light work, and this party is huge and heavy! We need folks in a variety of crucial roles including receiving, installation, de-installation, on-site engagement during both events and much more. Individuals who volunteer 3 hours of their time will receive one ticket ($40) to One Night: Absolutely Absurd on Saturday, May 15. You can sign up to volunteer online at www.oal.org or call Eliza Jones at 614-299-8225 for more information about volunteering! And, if you have 2-D or 3-D work to contribute to the silent auction (don’t forget—you get to split the proceeds 50/50 with OAL!) go ahead and sign up online or download the Entry Form and Guidelines at www.oal.org. To receive them by mail call 614-299-8225 or email oal@oal.org. Two great ways to get into the year’s party for free! Are you an artist? Or a volunteer? Either way, see you there! What’s May, and 15th, and absurd all over? 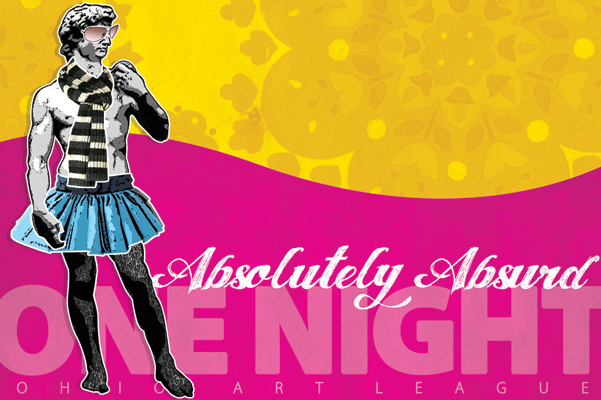 If you answered, “The Ohio Art League’s One Night: Absolutely Absurd” then you’re eagerly counting down to this bacchanalian bash like the rest of us… if not, then we’re starting to wonder about you! You do like art, right? And you do like to party? Oh sad, under-informed, non-ticket-holding reader, let me let you in on what’s in the works for this Night of Nights, after which you will simply have to have a ticket for you and your plus-one. I had the opportunity to sit down with the cheerful and industrious One Night Elves this week to drool over their grand design. First things first—the food! Minuteman Pizza will be providing us with a mountain of their delicious pies. Quite a few other vendors are coming down the pike as I write (and you read!) For those of you with a sweet tooth, Jeni’s Splendid Ice Creams will be in attendance along with Let’s All Eat Cupcakes. If that isn’t enough for you, our event space is going to be brimming to the gills with candies, cakes and more—if it’s packaged in plastic and it tastes like freckles and baby laughs, it’ll be there. Beer and liquor will be flowing like, well, wine, and there’ll be plenty of that as well. The night’s entertainment promises to be diverse and over-the-top; there are many names on the list, but so far we have the amazing Dr. Danga Grimaldi and his Exhibition Fantastique and the always fabulous Nina West. Mike Wall will be performing in concert with musicians from around the world—over Skype, during Patron Preview Night. A photobooth will be on hand to capture, in color (or black and white, if you choose), your bewitchingly attired, 6-drinks-deep hamming of it up. This year’s theme is “Absolutely Absurd” and, ladies and gentlemen, make sure you are outfitted appropriately! Brooks Brothers makes a fine suit but absurd they are not; be sure to come dressed flamboyantly, ludicrously, and above all, preposterously. This promises to be a sparkling night to remember! It’s also not too late to submit artwork for the show—after all, the ultimate name of the game is getting great art into the hands of great people. One Night: Absolutely Absurd is on Saturday, May 15th, 2010 starting at 8 p.m. until 1 p.m. Tickets for One Night: Absolutely Absurd are $40 and can be purchased here. For those who would like access to their next great art piece without the clamorous throng of revelers, a special, non-absurd Patron Preview will be held on Friday, May 14th, 2010 from 7:30 p.m. until 10 p.m. Tickets for this event are $100 (or $175 per couple) and cover both the Patron Preview and One Night.